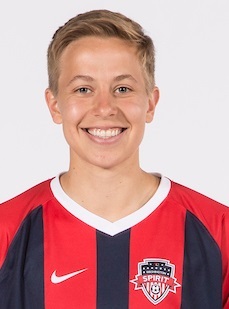 The Washington Spirit drafted Rebecca Quinn with the third pick of the first round (No. 3 overall) in the 2018 NWSL College Draft. Selected to Canadian Olympic Team to compete in the 2016 Summer Olympics in Rio, helping lead her squad to a bronze medal … competed for Canada in the 2017 Algarve Cup … helped lead Canada to the Algarve Cup title in March of 2016 … selected to the Canada National Team for the 2016 CONCACAF Women’s Olympic Qualifying Championship … took the spring semester of 2015 off to train with the Canada National Team as the squad prepared for the World Cup … represented Canada in the 2015 Pan American Games … named to Canada’s U-20 Women’s National Team that advanced to the quarterfinals of the 2014 World Cup in her home country where she started every match on the defensive end … started for the Canada National Team versus the U.S., May 8, 2014, and played the entire 90 minutes on defense… made her first appearance in the Canadian National youth program in 2010 at the game of 14. 2017 United Soccer Coaches First Team All-America … 2017 ACC Midfielder of the Year (the first player in Duke history to be honored with the award)… 2017 All-ACC First Team … 2017 MAC Hermann Trophy semifinalist … 2017 United Soccer Coaches All-East Region First Team … 2017 TopDrawerSoccer.com Best XI First Team … 2015 United Soccer Coaches All-East Region Third Team … 2015 All-ACC Third Team … 2015 All-ACC Academic Team … 2014 & 2017 ACC Honor Roll … Played in 22 of Duke’s 26 contests her senior year, drawing 21 starts and helped lead Duke to its fourth NCAA College Cup appearance.